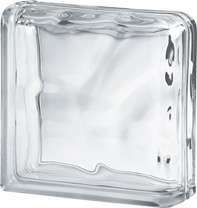 The Basic Line Curved End block finishes glass block walls with the elegance typical of superior product ranges. Ideal for creating flag type walls, harmoniously completing the 90 degree angle that is created as the junction between the 2 perimetral sides of the surface created with the Linear End block. By using the Curved End block it is possible to limit the use of other materials (cement, plastic, wood or alluminium), for a simpler and quicker installation and a lighter and more harmonious final result. It is compatible with all the Clear Line glass blocks and with all the Coloured Basics, and must be installed with a minimum space of 1 cm. The Curved Basic end block is available in neutral colour, wavy design and transparent finish. 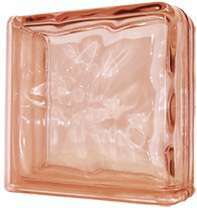 Form and function combine in this classic glass block, the first choice for applications in which the primary purpose is the passage of light and/or light effects. Use the 10 mm joint to purposely emphasize seaming for a more modular look.